Bangladesh is called the land of six seasons. All six season has different features and a particular scenario. Among them, the rainy season is really a special one by dint of its unique features. 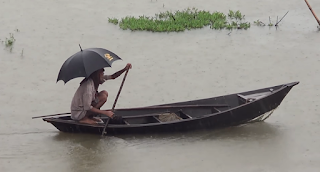 The rainy season is the second season of the Bengali Year. According to Bengali calendar, it comprises two-month Aahar and Shravan. But in reality, the season lasts much longer than those. Actually, it lasts up to Ashwin. During the rainy season, the environment looks soft and green. The tree and plants look so vivid. The weather remains dim. The sky is generally covered with a thick cloud. Sometimes the sun is not seen for quite a long time. During this season it rained cats and dogs. As a result, ponds, tanks, canals, and river are full to the brim. The rainy season comes with a refreshing shower to cool the hot-looking nature. Green leaves are seen to beautify the outlook of nature. The meadows are carpeted with soft green. The farmers are the real beneficiary of the rainy season. Because they get their long cherished water for irrigation. With the help of this rainwater, they are encouraged to grow more crops like paddy, jute, sugarcane, tea, and many other seasonal crops. Rain washes away the filth and dirt from the earth’s surface. It also purifies the atmosphere. Despite some great advantages, the rainy season also has some disadvantages. It is a curse on the poor working class people. Because they have no work and no money to lead their lives. Besides, the shelter people also have to suffer a lot. The roads get muddy and slippery in the rural areas. Moreover, due to too much rainfall, it often causes floods. And floods cause terrible havoc on the people. Bangladesh is a freebased country. So the importance of rainy season is undeniable here. It is no doubt a blessing to Bangladesh despite having some drawback. Bangladesh is a darling child of nature. It has six seasons. The rainy season is the second season of the Bengali year. It comes after the scorching heat of summer. It comprises the Bengali months of Ashar and Shravan. In fact, it extends from the end of June to the end of August. The rainy season has many advantages. It is a blessing of nature in Bangladesh. Cultivators’ plant aman (Bengali Rice) crops in this season. Aush (Bengali Rice) paddy and jute grow well during this time. We get plenty of fishes in the rainy season. Crops, plants, and trees grow rapidly in time and make the water dirty. Things are washed away by the rainwater during this season. The rainy season has some demerits too. In the rainy season, village roads go under water and become muddy. Heavy rainfall causes the flood. We know how devastating flood is. Crops and houses are damaged by the flood. Floods take away man’s life and property. In conclusion, we can say that the rainy season is a mixture of blessing and curse. But we forget this curse when we think of its blessing. The rainy season has great economic importance. So, we are really blessed by the rainy season.